Been thinking of getting the upgraded XBOX ONE S with a humongous terabyte of memory storage? You won't want to miss out on this incredible one-day sale on Xbox One S 1 TB bundles taking place at GameStop on Wednesday, December 20, 2017. 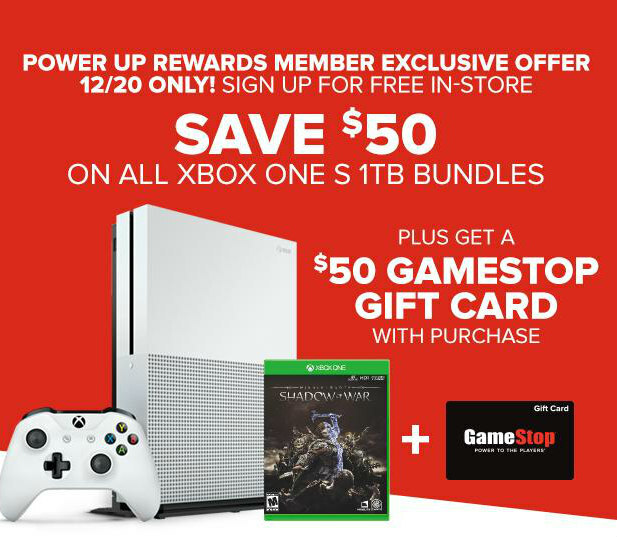 This is an awesome offer exclusively for GameStop PowerUp Rewards members! Not a member? You can sign up to become one for FREE at any GameStop store to take advantage of this one day only special offer. This offer is only good for ONE DAY (December 20), in-store only, and available to PowerUp Rewards members of any level (Player, Pro, or Elite). Don't miss out on this great opportunity to save $50 off the purchase price of an XBOX ONE S 1 TB bundle and get $50 to spend at GameStop.